Size of Male: 6-35 lbs., 9-19 in. Size of Female: 6-35 lbs., 9-19 in. The American Eskimo Dog actually has nothing to do with Eskimo culture. These beautiful white dogs are the descendants of the trick dogs who traveled with circuses throughout the United States in the 19th century. 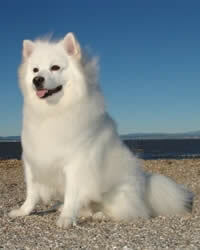 “Eskies” are recognizable by their spitz looks – they have a bright white coat, jet black eyes and nose, and erect ears. They carry their tail over their backs. These former circus dogs are intelligent, friendly and very eager to please. They come in three size varieties. Eskies make excellent family companions. The American Eskimo Dog is a member of the spitz family of dogs. He’s descended from European spitz dogs such as the German Spitz, the white Keeshond, the white Pomeranian and the white Italian Spitz. These were all dogs which were used in trick-dog acts by traveling circuses in the 19th century. They were prized for their beauty, their intelligence and their agility. These dogs were commonly found in German immigrant communities at that time and had been brought to the U.S. when their owners immigrated. The dogs were known as American Spitz dogs back then. In 1917 the name was changed to American Eskimo Dog. The dogs were finally recognized by the AKC in 1995. Today they are popular companion dogs. The Eskie is an intelligent, trainable, friendly dog. They are said to be slightly “conservative.” They should never be overly show or aggressive. They can make good watchdogs because they are very alert and notice everything that goes on. They are protective of their home and family but they don’t threaten to bite. Eskies are somewhat territorial. Dog training is generally easy, they are eager to please and they are extremely loyal dogs. This dog breed is also very gentle and good with children. These dogs tend to be very energetic so you should plan to provide plenty of exercise for your dog. Otherwise they can get into trouble in the home since they are so smart. They can invent their own ways to keep themselves occupied, which doesn’t always please their owners. Eskies get along very well with other pets. Living Environment – This dog breed generally prefers cooler weather but they do well in all climates. They are energetic dogs so they need plenty of exercise. As companion dogs they like to be around people and they can make good apartment dogs if they get enough exercise. Grooming – This long haired dog has a thick double coat that needs regular grooming to avoid matting. They should be brushed out about twice a week. They are an average shedder. Diet & Exercise – Dietary needs for this breed are normal. However, they are very energetic dogs and they need plenty of daily exercise. They do best if they have a yard of their own. Health – Eskies are generally healthy dogs but they can be prone to progressive retinal atrophy, luxating patellas (slipped kneecaps), and canine hip dysplasia. Dog allergies and tear stains can also show up in some dogs. If you are interested in getting an Eskie you should talk to a breeder about possible health problems in the breed. As the descendant of circus dogs, the American Eskimo Dog is highly trainable. They are intelligent, clever and love to please their owners. Dog training comes very easily to them. They are also very agile and they can learn many tricks. Positive dog training is recommended (praise, rewards).